Welcome to the Holiday edition of Quilted Lizard Tales. Thank you for your interest in my work and signing up to receive my quarterly newsletters. I am so excited that my teaching trips introduce me to so many wonderful people like you. For those of you who have taken workshops with me this year, I want to thank you for your enthusiasm in trying something new…..whether you made an Accidental Landscape, a wacky log cabin block with “teeth,” a wild waves fabric, a Random Rose block or a Happy Village, you all succeeded beautifully. Bravo! The 2nd edition of Happy Villages rolled off the presses in Hooksett, NH in early Fall. 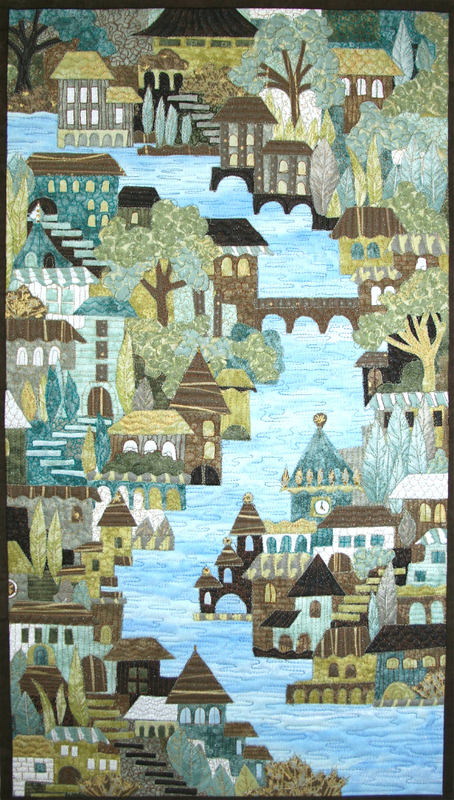 It includes updates to the suggested fabrics, a numbered template for the step shapes, templates for trees, potted plants, boats, etc., behind-the-scenes photos showing the fabric collage design process and many new villages to inspire you. Here is “River Town” one of the new villages. 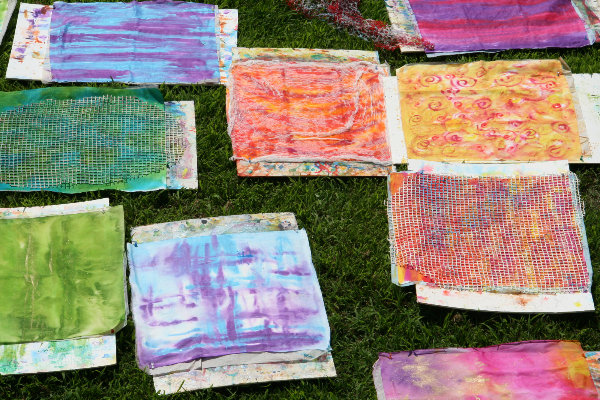 I took advantage of the hot Summer sun in August to do some sun-printing on fabrics. My choice of paints is Setacolor transparent paints by Pebeo. They are heliographic, which means they are great for sun prints, among many other techniques! They are also easy to use and clean up with soap and water….a real plus! 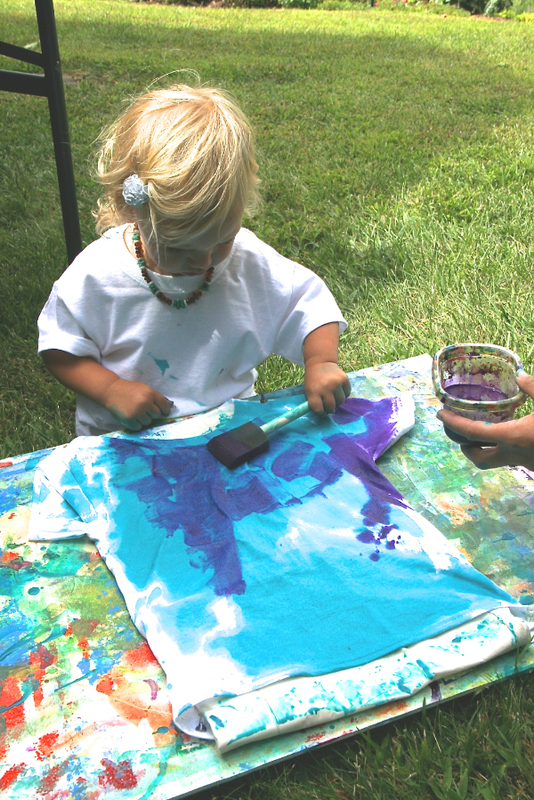 Here is my granddaughter, River (age 19 months) painting her first t-shirt with setacolor paints. 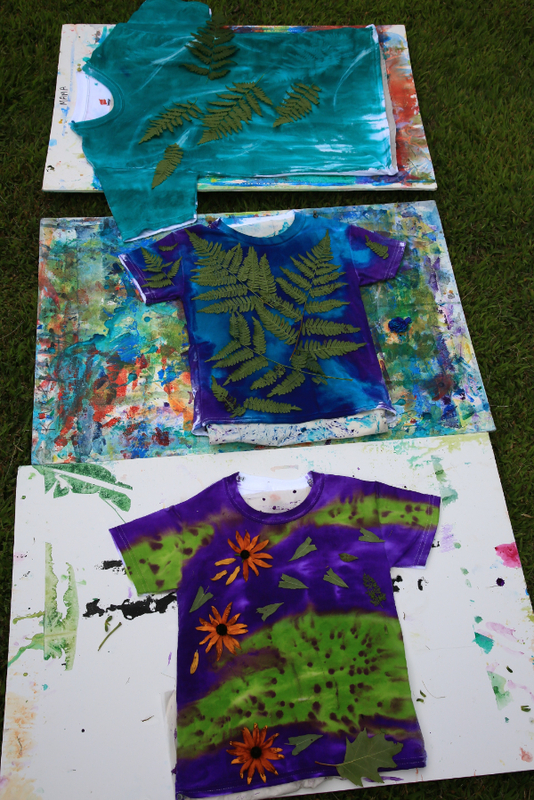 We placed fern leaves and flowers to create sun prints on her shirt. Her three older brothers had fun painting their own t-shirts too. 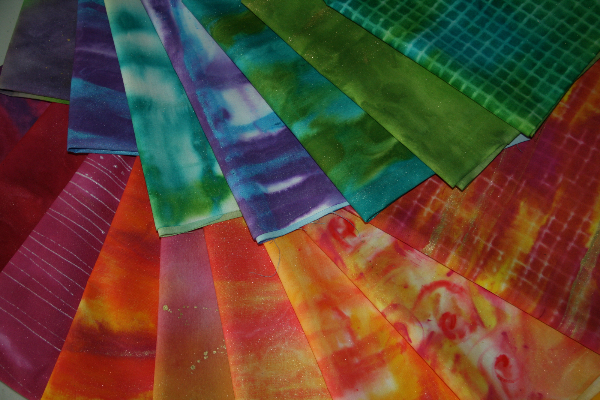 Here are some sun-print fabrics that I made using cheesecloth and rubber skid mats (the finished product on left, and drying in the sun on right). It’s very likely that those grid-like fabrics will show up in a Happy Village fabric collage soon. In the Summer newsletter you got a peek at this quilt. I was still trying to come up with a name for it and finally decided on “Rambling Roses.” It measures 42” x 60”. 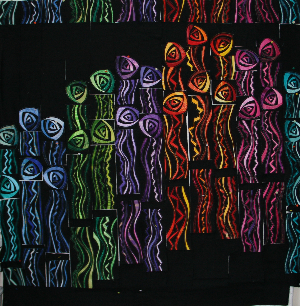 It is part of my “Finding Center” series of quilts using my Random Rose blocks. 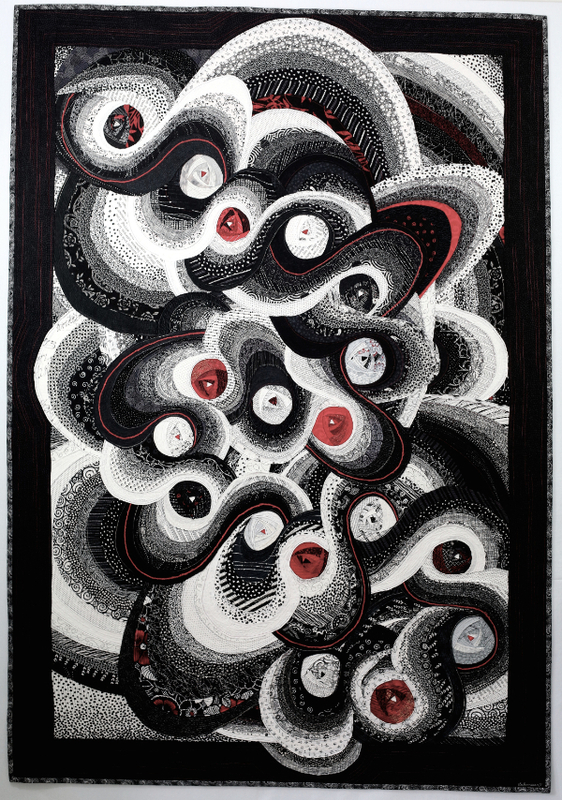 The challenge in this piece was to include “S” wavelengths into the design to create a yin yang type flowing pattern. I am keeping my fingers crossed that it will get juried into the American Quiters Society show in Paducah, Kentucky. Notifications will be sent next March. I will keep you posted. 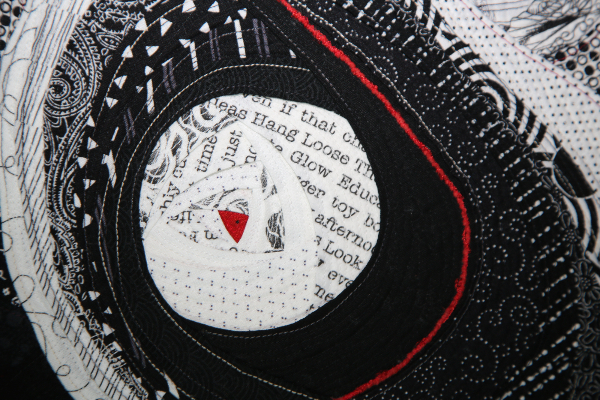 The close up shows the text fabric that I made. All of the words are from my daily collage journals, a.k.a. morning messages. It includes a run on paragraph of words and phrases, which are both inspirational and fun. Speaking of shows “Rhythm & Roses” won a 3rd place award at the International Quilt Festival in Houston, Texas this Fall. It will be included in a one year travel exhibition of Quilts, Inc. shows (Chicago, Minneapolis and Portland), so you may get a chance to see it in person when it comes to your part of the USA. A Random Rose Vest and a PocketBOOK! During the year, many of you inspire me with your suggestions and ideas. For example, “Have you made a jacket yet with your Random Roses?”…or how about a skirt with the Layered Waves?...or how about a jacket with Happy Villages? I love a good challenge and am happy to say that I just completed one of the ideas by using the Random Roses as a “faux lapel” on a vest. Here I am wearing it with Linda and Sandie during a Random Rose workshop with the Mississippi Valley Quilters Guild in Moline, IL. I used the Random Rose blocks from my Layered Waves book and combined it with my vest design in my Wearable Waves book. 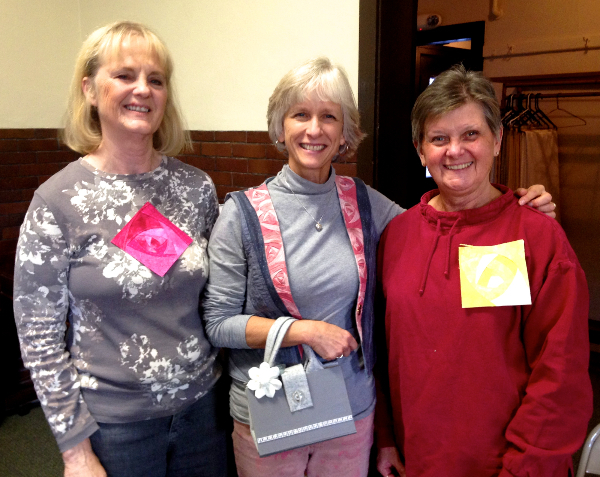 It just so happens that these two wonderful women create purses from recycled hard cover books. I just HAD to buy the gray one to match my new vest. Isn’t it perfect!? Now I am inspired to try recycling old books into purses. Yet another creative outlet to try! Happy New Year and I hope our creative paths cross (again) in 2015! 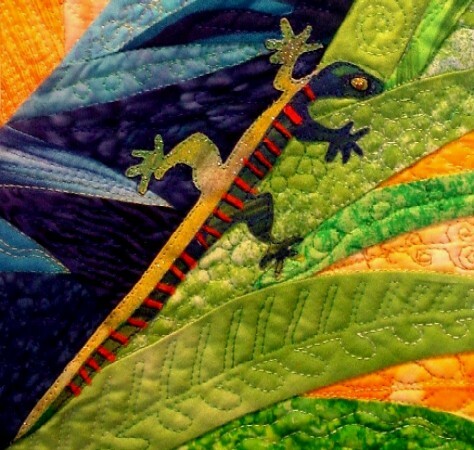 Copyright © 2014 The Quilted Lizard Fiber Art Studio, All rights reserved.